Happy Easter to you all! 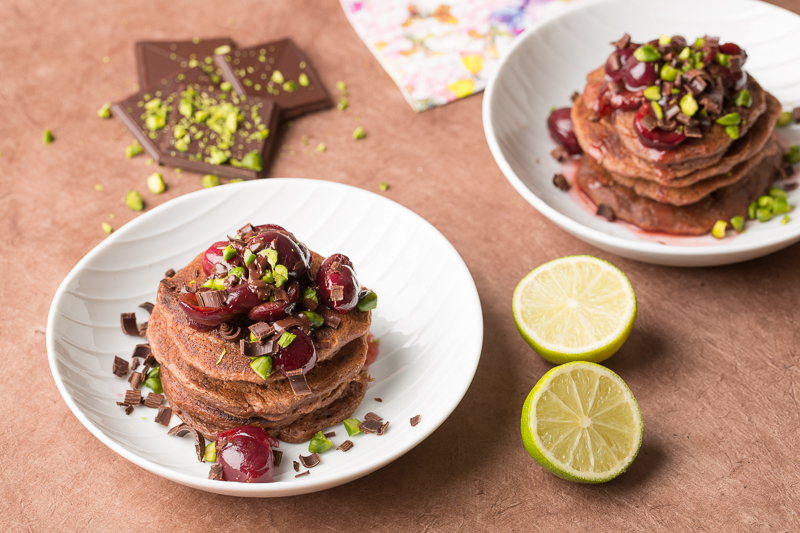 As usual I intended on posting a special Easter recipe that you can prepared for an Easter brunch but I am a little too late seeing that it is already Easter Monday. However, as it is not customary for me too make exceptional meals on any given holiday I aim for celebrating life in every moment and even if it is a totally normal day in the year. If you feel like eating something more elaborate than go for it. I’ll be the first to commend you. I have been making sourdough bread recently and because I have a lot of leftover sourdough starter I try to use it up in different recipes. It wasn’t my ingenious idea. I got it from the ever inspiring baker over at The Perfect Loaf. 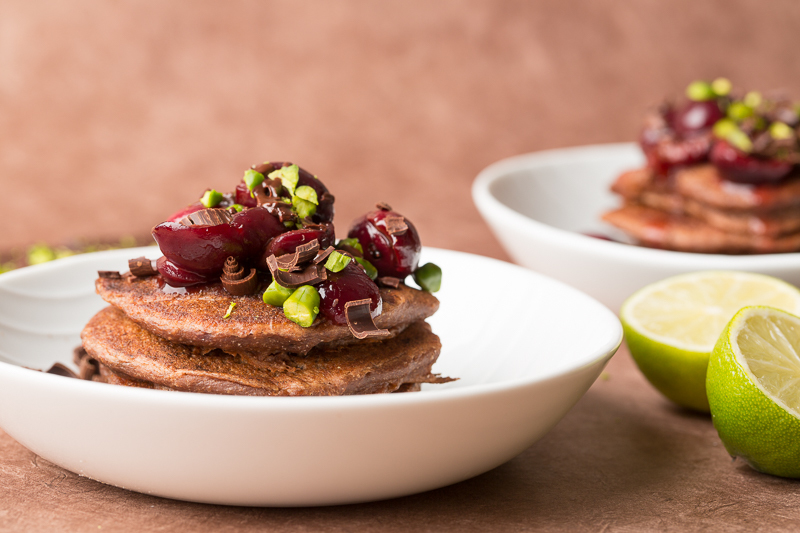 Besides using his sourdough starter in pancakes he also uses it in waffles and banana bread. So far I’ve tried it in banana bread and pancakes and both with exquisite results. Seeing that his recipes are not plant based I’ve adapted them to be vegan and making tweaks so that they suit my taste. I love veganizing non vegan recipes. It gives me a great sense of accomplishment, as if I have solved a really complex math equation. Anyhow, I will try to describe the whole sourdough bread making process once I have become more confident but essentially making a sourdough starter only requires two ingredients and the rest is taken care by fermentation. Besides being really healthy it lends baked goods a lovely porous structure as you would see in a naturally leavened bread. The crumb is also very open and the pancakes are incredibly fluffy. I went into more detail about my bread making journey in this post. At the time I was writing in German, so forgive me if it seems a little confusing at first. I will translate the post once I have a little extra time. To sum it up shortly, I found it difficult to make sourdough in the beginning. I got very inconsistent results and my sourdough starters often went moldy. The best results so far I’ve had since following the blog The Perfect Loaf. The process involves adding new water and flour every day and discarding quite a lot each day. In the beginning my low waste heart cried at the thought of throwing perfectly good starter away so I was intrigued and relieved by the idea of creating other baked goods with the same sourdough starter. When I am not baking bread regularly I just put my starter in the fridge and when I’m ready to use it again I pull it out of the fridge and feed it a few times before making a bread. The leftovers usually can be kept for up to a week or even more. Generally I have been able to use it up within a week. 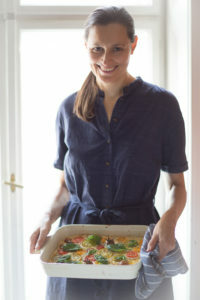 Another project that is definitely on my to do list is pizza made with sourdough. That in my opinion is the ultimate pizza. I have done it a few times but not consistently and with various degrees of success. 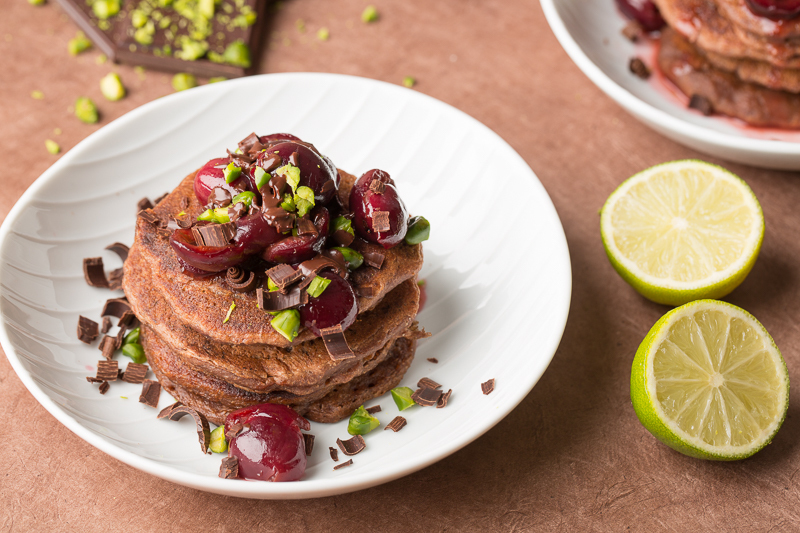 The sourdough pancakes have been tested several times and with equally good results. For those of you who are daunted by the idea of making sourdough pancakes or bread, I can honestly say it takes really very little effort and the rewards are great. There is something very satisfying about producing your own naturally leavened bread and these kinds of recipes open a new world to explore the endless possibilities of sourdough. I encourage you to visit sites like The Perfect Loaf or Breadtopia for really excellent resources on bread baking. I have been following both blogs and am amazed at the knowledge they provide and the sheer joy they exude about the art of bread baking. 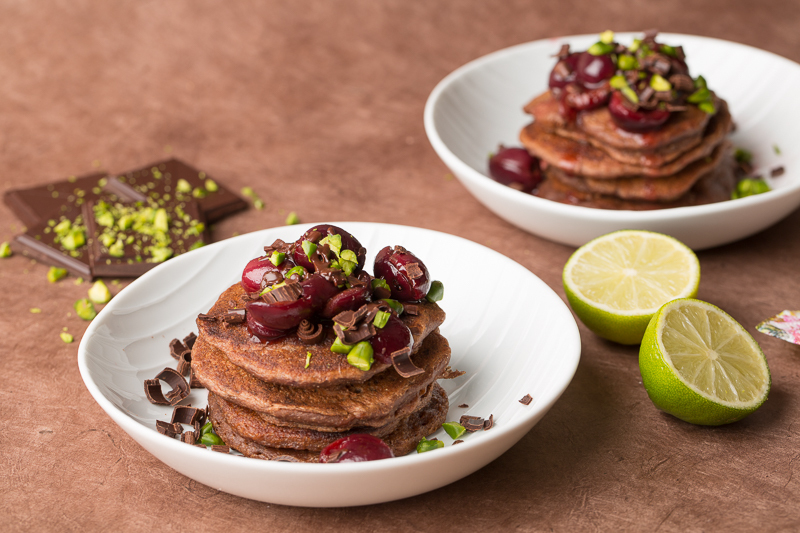 For those of you who are not partial to learning about bread baking and cultivating your own sourdough starter I have included a simplified recipe for you to make similarly delicious pancakes. I basically included a similar liquid to dry ratio as in the sourdough pancakes. 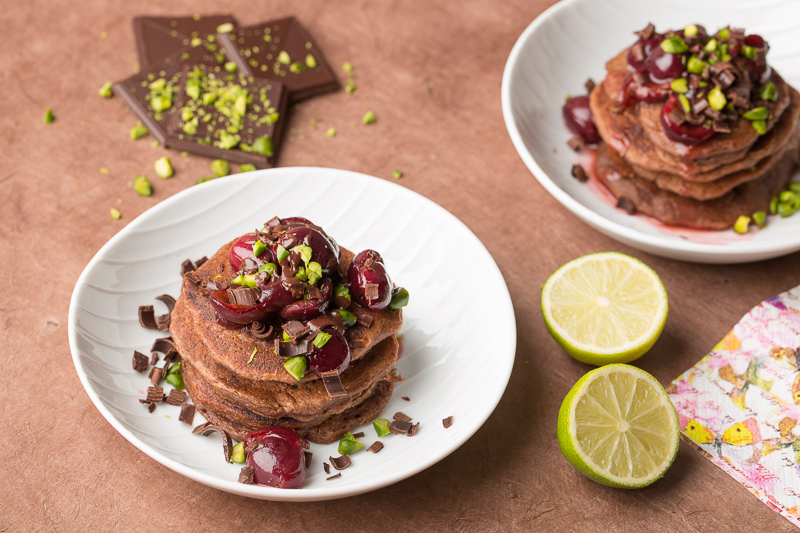 Whatever you choose, I hope you will enjoy these pancakes and of course I would be delighted to hear from you if you try them and to hear about your sourdough journey if you are on one. Anyhow, before I go I should mention where I got the delicious cherries in March/April. My dear friend Manuela has a mother whose garden is overflowing with produce and fruit as well. Recently my husband visited her and came home with 2 kgs of cherries and I started thinking about what I can do with them. 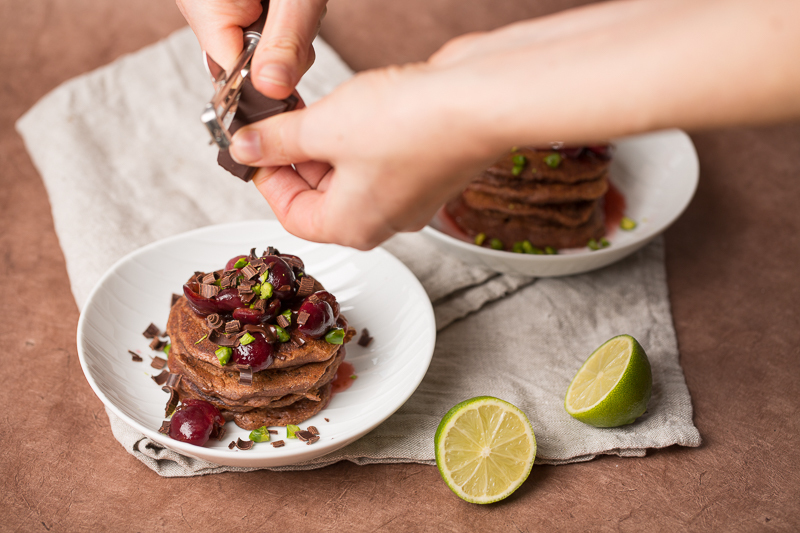 I made these pancakes and a chocolate cake as well and since I don’t have any pancake recipes on the blog, here we are. So let’s move on to the recipe. If you make them please tag me on Instagram #veganart. Thank you! *for the non sourdough version simply omit the sourdough and replace it with 120 ml (1/2 cup) more milk. That’s it. To make the cherry compote, place all the cherries in a pot with a lid and combine with all the ingredients except the arrowroot powder. Bring to a simmer and cook until the cherries release their juices, around 5 minutes. At this point combine the arrowroot powder with 2 tablespoons of water in a small dish and whisk until combined. Add this mixture to the cooking cherries and continue to cook while stirring for about 2 minutes or until the mixture begins to thicken. Remove from heat. In a large bowl whisk together the flour, cacao powder, baking powder, baking soda, salt, coconut sugar, vanilla and cinnamon. In a separate small bowl whisk together milk and sourdough starter, apple cider vinegar and melted vegan butter. Add the liquid to the flour mixture and whisk until just combined. Do not overmix; the batter should have some lumps. Lightly oil a large nonstick cast iron skillet and heat over medium-high heat. For each pancake spoon out about 2 large tablespoons full of pancake batter onto the skillet . When small bubbles appear in the center of the pancake, it is time to flip it. Let it cook on the other side for about 1 minute more. Repeat with the remaining batter oiling the skillet as needed. 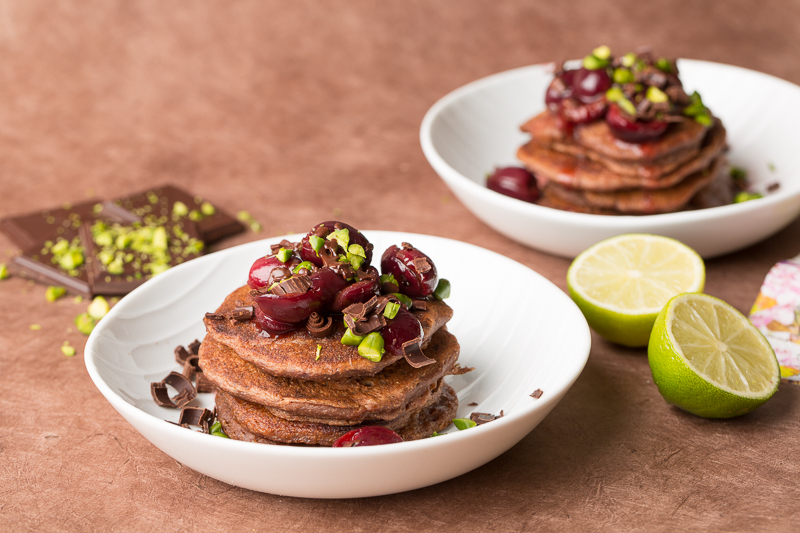 To keep the pancakes warm you can preheat the oven lightly and put them in the oven in a dish. 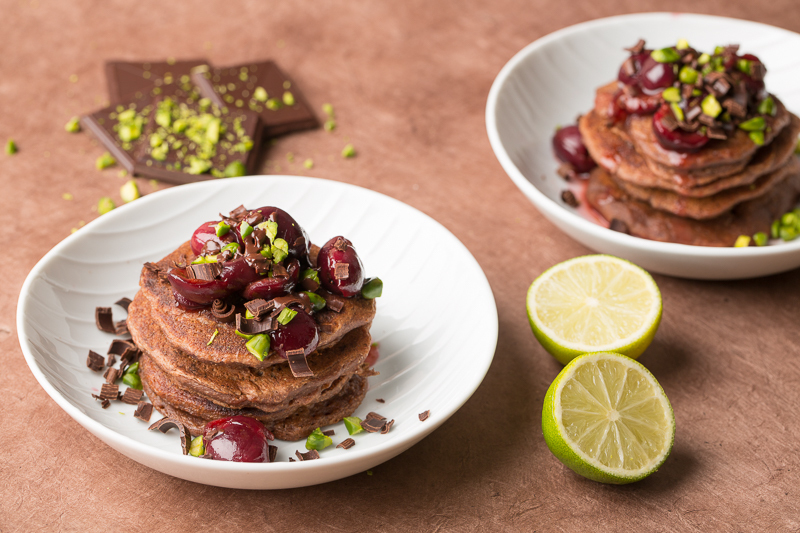 Serve the pancakes with cherry compote, chocolate shavings and pistachios.